The Livestrong LS9.9T treadmill is an affordable machine that can be used for endurance training, weight loss, and low impact cardio fitness. With its impressive features, it is one of the best machines on the market in the $1000 range. The LED display windows on the Livestrong LS9.9T treadmill show time, distance, calories/heart rate, speed and incline. The pre-set programs include Manual, Speed Intervals, Peak Intervals, Weight Loss, Rolling Hills, Foothills, Mountain Climb, 5K/10K, Race Pace, and Custom. It comes equipped with the Livetrack™ Fitness Journal, an on-board computer program that records your daily, weekly, and lifetime fitness progress. Unit Weight/Dimensions — 240 lbs; 74" x W: 36" x H: 58"
This is a new model from Johnson Tech that is sure to be on a few Best Buy lists for 2010. It comes with lifetime warranties on the motors and frame, plus extended 2-year coverage on parts, and unlimited in-home repairs for the first year. 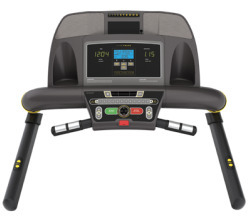 The Livestrong LS9.9T treadmill is straightforward to assemble, and offers a very quiet, smooth operation thanks to the big 2.75 CHP motor under the hood, and it has a comfortable cushioned deck that is less jarring on the joints. As for programming, you can choose from pre-set workouts that automatically adjust incline and speed levels for endurance training. The first treadmill reviews on this 2009-10 model are all thumbs up, with the only niggly odd comment that the LS9.9T is “too heavy.” Hey, that’s the compromise you make with treadmills when makers are trying to keep prices down for you. If you want something lightweight to carry down the basement stairs, then get a flimsy 96-pound thing, just don’t expect it to feel very stable. The rugged 240-pound Livestrong LS9.9T is heavy, but it makes no excuses for its sturdy club model feel which makes it all the more able to hold up to an overweight runner doing intervals. Priced at just $999, the Livestrong LS9.9T offers BIG BIG value, arguably the best on the market right now. It has a larger motor at 2.75 CHP than any competitor priced under $1000, and it offers power incline, a folding feature, challenging programming, computerized fitness journaling, and can carry a 325-lb user. As many of the $999 top-rated competitors from a year ago have seen some large price increases and are no longer in the $1000 range, the LS9.9T stands among the top models for 2010 in its class. 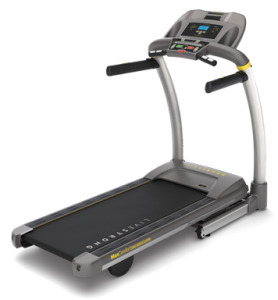 The Livestrong LS9.9T treadmill easily lives up to its Lance Armstrong Foundation endorsement.